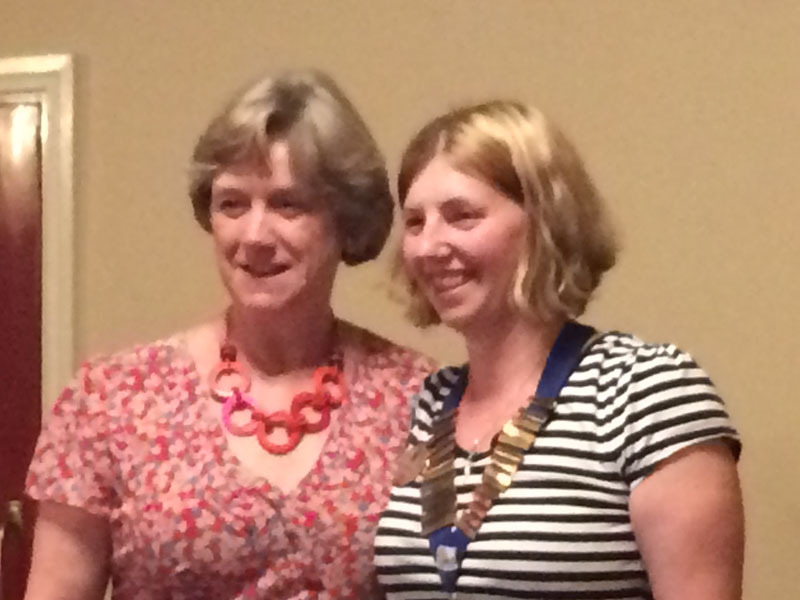 Having received the chain of office from outgoing President Ann Gregory, Angela started her term of office by inducting new member Julie Huggett. The year commenced with a wonderful Meet the Presidents with President Geoff Smith from the Rotary Club of Church Wilne. Blessed with beautiful weather and the opportunity to enjoy the music, food and gardens of Thurlestone Grange due to the kindness of Quentin and Karen Robbins. Inner Wheel members helped with the event by bringing desserts, which were appreciated by all. 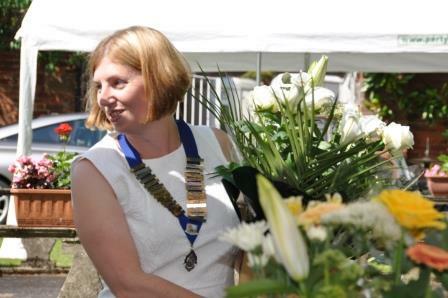 The first major fund raising event of Angela's year was the annual Horse Ride organised by Church Wilne Rotary with the Inner Wheel manning the tea and BBQ tent. Again blessed with good weather for the horse ride Inner Wheel Members received many compliments from the riders following the food and drink provided on the day. We were cool in the face of adversity when we discovered that we had no way to provide gas for cooking the food but help was at hand and all was well without any customer noticing anything was wrong! 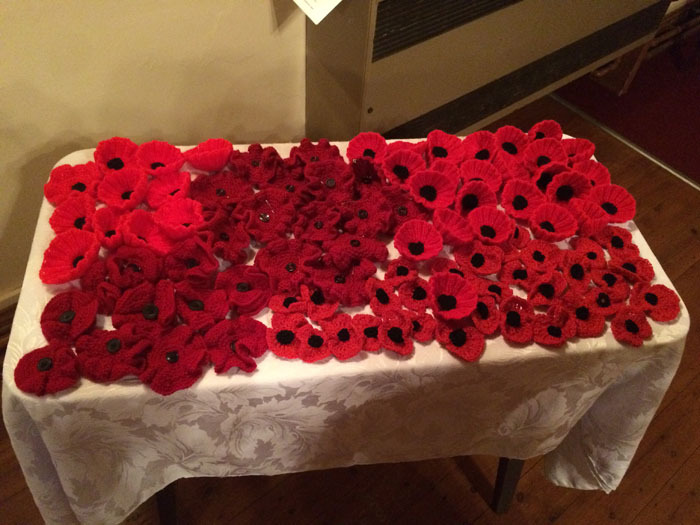 During September, Monica Welbourne and others were busy with the knitting needles knitting poppies in response to an appeal from District to create a display in Nottingham to remember the war in aid of the British Legion, each poppy to be sold for £2. Additional poppies were brought to the meeting and sold out like hot cakes to all the members raising further funds for 'Help for Heroes Angela's charity this year. 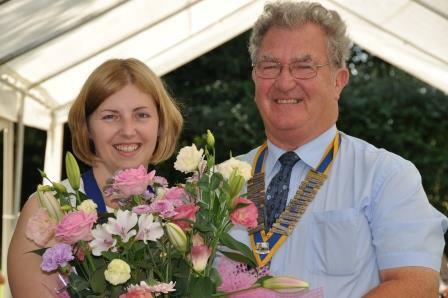 Also in September, the District Chairman Rachel Cooper who talked about her charity this year, Air Ambulance that is also a charity dear to the hearts of our Rotary Club who support the same charity, visited us. 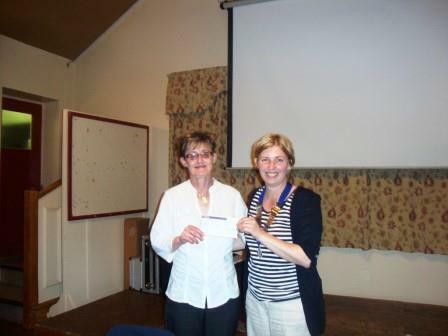 In October, everyone enjoyed the Quiz night that was organised by Ann and Paula with Amy as question master. The evening included a fish and chip supper and was hugely enjoyed by all. Also in October, Monica reported that her knitting needles were again at the ready and she had been busy making Christmas puddings for International charities that looked wonderful and were admired by all. 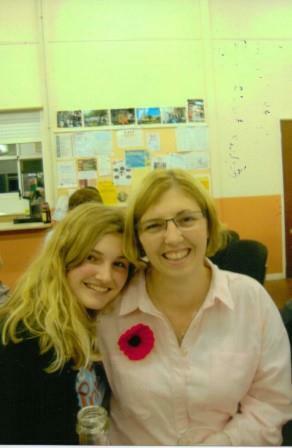 with her daughter at the October 2015 quiz night. November saw us all getting creative. 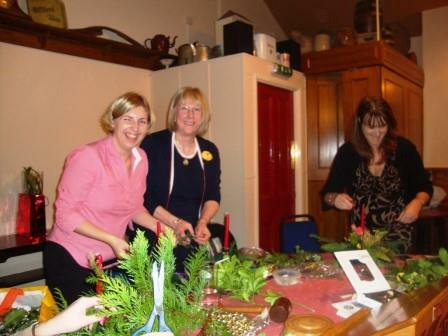 Ann Gregory organised a Christmas crafts evening and we were again very proud of our table arrangements and candles to take home and display in time for Christmas. 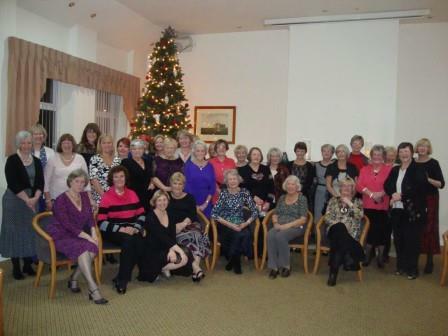 The Inner Wheel Christmas Dinner was held on 9th December and was much enjoyed by all who attended. The evening included a quiz and Jan kindly acted as question master with Joyce doing the 'now famous' left and right game! President Angela is kneeling third from the left front row. 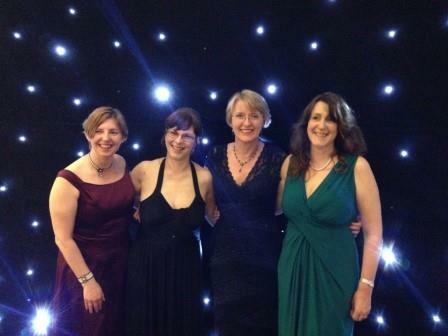 Many of us also attended the Rotary Snowball that was a wonderful evening, very well arranged by the Rotary gentlemen. President Angela front row in blue with organiser Anne Gregory front row left. A very good turn out with most of the Inner Wheel members present. 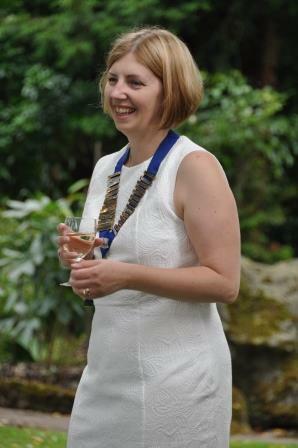 In February, Paula arranged a wonderful trip to Kensington Palace and a full coach of ladies travelled to London on a crisp sunny day. This was a super way to enjoy a day in our capital with free time for everyone to do as they liked during the day. In March, President Geoff joined us for the evening and amazed us all with the history of the Chelsea Flower show and his past involvement in the event. 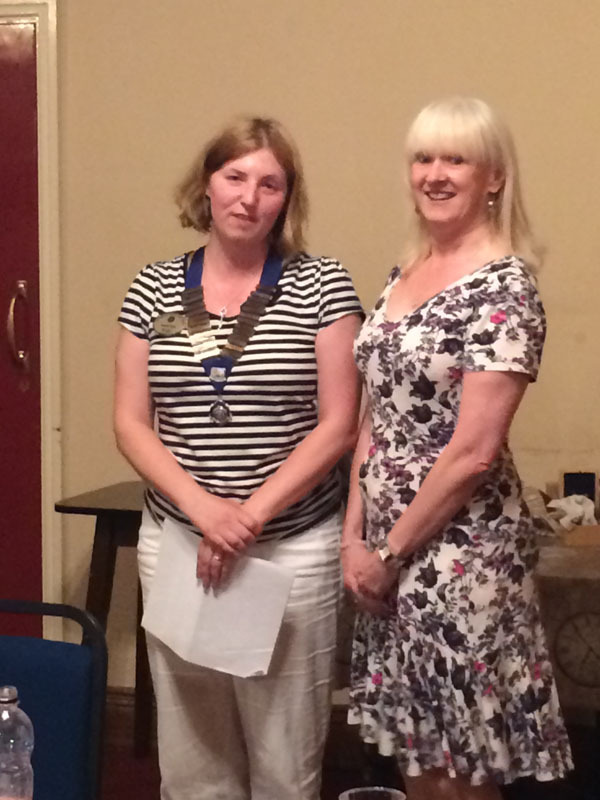 We were delighted to receive an invitation from the Inner Wheel Club of Long Eaton on Monday 13th April. 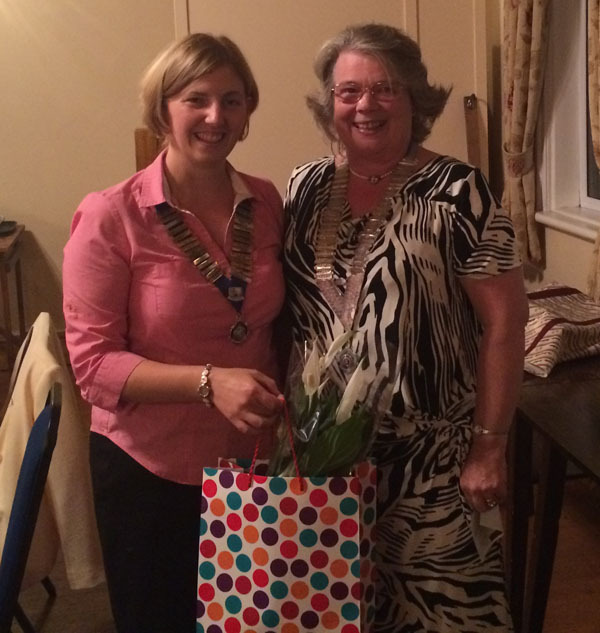 The evening was very well attended by 19 Church Wilne members who all enjoyed the event. 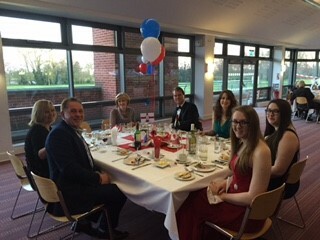 In April was the highlight of Angela's year hosting members, Rotarians and friends to the St Georges Charity ball at Trent College. 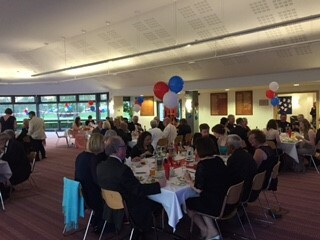 The sun shone, the band were wonderful, the decorations looked great and the food was enjoyed by all, thank you to everyone who made the evening the success that it was. 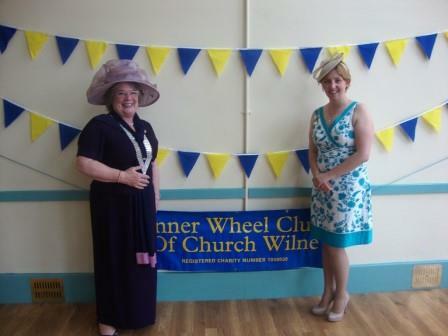 Inner Wheel members Stephanie Cooke and Diane Addy. 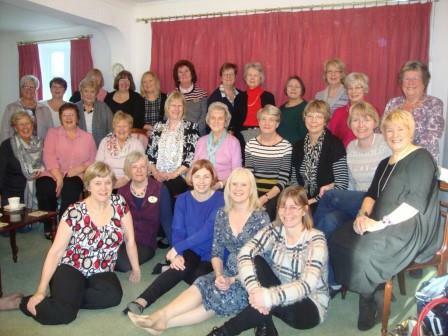 On Saturday, 9th May, a number of Inner Wheel members supported the OAP afternoon tea that was a wonderful event. The event included tea and dancing with impromptu entertainment by Adrian Perkins. To encourage the ideals of personal service. All with fun and friendship. 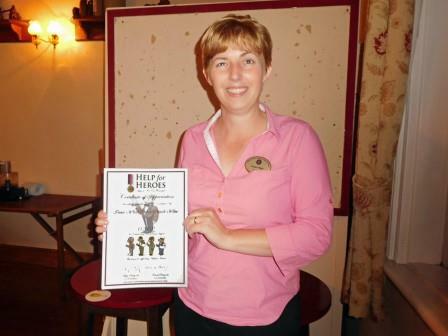 At the end of her year Angela, with the support of all the Inner Wheel of Church Wilne members had raised an impressive £1,300 for her chosen charity, Help for Heroes.